I'll let you in a on a little secret...Im kinda obsessed with mint green nail polish, so when Barry M released their spring shades, I was like I have to own the green shade. Even though I own about 50 of them (probably the same shade of mint green) and currently have nails that my grandmother would be ashamed of. However I had to own it. Sugar Apple is a gorgeous mint green shade almost like Mint Candy Apple from Essie but a little more muted. 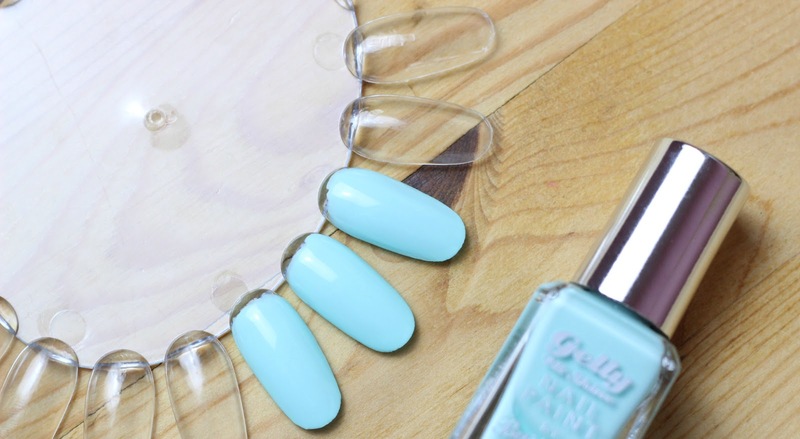 A gorgeous pastel shade that makes the nails look so pretty for spring. I am a huge Barry M fan as you may know from my recent best of post. The Gelly Range are my fave, they look great on the nails and last for ages. Wear time is around 4-5 days before chips start to appear. Which I think is rather good. You will need 2 coats of this polish to get a full opaque finish, usually the norm with Barry M polishes. I'm not going to go into too much depth about a nail polish, but I will say this, you must buy this nail polish. Its the only shade you will need for the spring and summer months. Its a soft pastel shade, the finish is amazing and the price is under €6. What more could you want ladies. I also have my eye on the blue shade of the spring collection. Barry M need to stop making pretty colours because this spending ban that I plan on continuing for 4 months is going to be so hard. Lord give me strength. I won't even talk about the new Models Own Polishes. I want them all. This post has rambled on hasnt it. Lauren don't write posts at 1.31 am. Have you tried this polish? What colours do you like to wear in the hotter months?